DIY or Hire a Contractor for Your Carlsbad Home? Thinking of selling and upgrading your Carlsbad home–or just updating it as a DIY (do it yourself) or using a contractor? These are questions our San Diego real estate clients ask us on a regular basis–and our answers will vary depending upon expertise and determination of the homeowner. Perhaps you’re preparing your home for sale in San Diego, or you’ve just moved into your home and want to tackle some of the changes you’ve considered making. Knowing which items to do yourself and which need a professional licensed contractor can save you from some costly mistakes. If you are really handy, tackling projects in your home may be right up your alley. If you spend lots of time watching home makeover reruns on cable and envision creating a fabulous transformation all on your own, be sure to consider the possible consequences. Remember there are always professionals (designers, craftsmen, tradesmen and carpenters) watching over (and correcting) the process. Doing-it-yourself (DIY) when the stakes are high (such as when selling your home, rewiring electrical or knocking out a wall) might give you a bigger headache than you want. Here’s a basic rundown of what you might tackle yourself–and which items definitely need a professional touch. Is it doable? Painting walls, resurfacing or refinishing cabinets, hanging drapery rods, even changing light fixtures is easily doable if you have basic skills and review them on a site like YouTube. If you’re looking at scraping that popcorn off your ceiling, however, you need to check with your local building authorities to see if yours might have asbestos. Homes built before the laws changed in the mid-70s may or may not have asbestos ceilings that require special (and often expensive) removal by guys in gas masks and white suits. Is it safe? You may have the skills to change light bulbs and fixtures, but beware if they are located in the peak of a vaulted ceiling over an open staircase and require artful scaffolding to reach. In that case, you might need a professional with the correct equipment. If you do tackle a potentially hazardous project, be sure to have all required safety gear including goggles, gloves, mouth filters and the like. Is it prudent? Many plumbing tasks—changing out a faucet, for example—are perfect options for a budding DIY-er. Moving pipes in the walls, installing shower pans and other projects that could cost you plenty if they created a leak inside your walls, might just end up being the proverbial Money Pit. When you hire a skilled contractor to do the work, make certain he or she is licensed, bonded and insured. That way, if a leak forms later and your tub falls through the floor, you’re likely covered. A seasoned professional should handle concrete work of any type since the chance for something to go wrong is quite high. Want to tile your bathroom floor? Go for it! Is it legal? Exterior changes, such as roofing, new windows, skylights or siding, require a contractor that knows the requirements to make your home watertight and energy efficient. And who also knows what permits to pull! Removing a large tree can be dangerous unless you’re a skilled arborist, since falling limbs (or a falling tree) can cost you repairs to your own home or vehicles, your neighbor’s fence, utility lines or even injury from using unfamiliar tools such as a chain saw. Before you start a DIY project for the first time, check with your local big box stores to see if they offer classes. You can also glean valuable information and tips from YouTube. 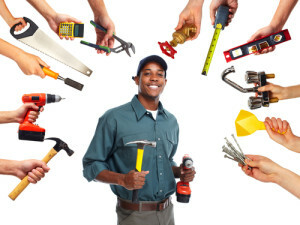 The tools, glues, mortars and other materials your grandpa or dad used may have changed over the years, so be sure to ask professionals about drying times, set speed, the need to use undercoats or primers –nd anything else you can think of before you start. When making changes prior to before a North County home sale, please feel free to give us a call beforehand and we’ll be glad to share our thoughts and experience. Some changes may be unnecessary and others could actually lower the price buyers are willing to pay for your home. These are not the type of improvements you want to make! For some timely advice, please feel free to call Roberta or Scott Murphy at either 760-942-9100 or 760-613-6190–or email roberta@sandiegopreviews.com.